If you are looking for information on the Magnetsigns franchise business opportunity, Magnetsign franchises or Magnetsigns franchising, then you have come to the right place. Magnetsigns is the world's largest sign rental network and we are rapidly expanding. Magnetsigns unique concepts, patented processes and products and powerful systems offer you the real competitive edge. Choosing a business for yourself is an important decision and Magnetsigns is committed to helping you get the information you need about Magnetsigns to make the best decision for your future. A revolutionary patented advance in portable signs. Our signs use easily changed magnetic letters and graphics. A Magnetsign is a high-quality sign that sets a new standard in the portable and permanent sign industry. Magnetsigns is the manufacturer of its own signs, which ensures each sign receives our highest quality workmanship. Magnetsigns franchisees receive a personal intensive startup-training program, which includes computer design, sign layout, sales training, moving signs and administration. Ongoing training is offered through regional franchisee forums and onsite franchise visits. We will be offering training in financial analysis, business planning and securing financing soon. Designing a crisp clear sign is simplicity itself! Experience in graphic design and production techniques is not required. Magnetsigns comprehensive training program and layout samples CD will assist you to become proficient in no time! Working with magnetic letters and graphics is a pleasure. 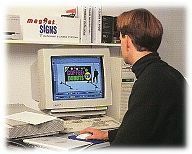 Layout tools and techniques allow even new franchisees to layout professional quality signs. You'll stand back and admire your creations. New franchisees are introduced to our tools designed to make moving signs easier. The dolly system shown here attaches to the sign stands for quick easy sign moving. A multi sign trailer with overhead crane is available. Our comprehensive training program includes step-by-step guidance through the sign placement process. You'll learn how to put our professional full-color marketing materials to work in building a long-term customer base. An overview of all necessary bookkeeping procedures is provided during training. Even those inexperienced in bookkeeping are helped to keep accurate records. Magnetsigns has ongoing research and development into market trends, new products and services and new production processes. We are committed to finding and implementing cutting edge technology. The franchisee only website will provide you with tremendous support as your direct link with our corporate office and all other franchisees. When you have a winning idea to share or a question to ask, this is a great place to do it. Magnetsigns is working hard to strengthen and grow the Magnetsigns Brand through training and support of its franchisees.